Water-resistant colors that possess superb coverage and dry rapidly to a brilliant, silky, metallic finish. 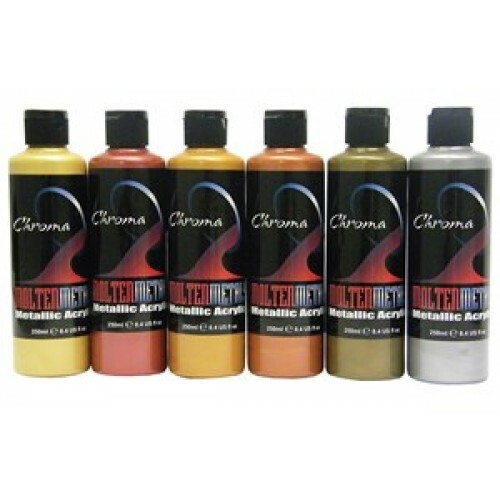 Chroma Molten Metals Metallic Acrylic is useful for painting on paper, cardboard, canvas, metal or plastic. Can be used alone as a palette color or mixed with other acrylic colors to create dramatic iridescent effects. 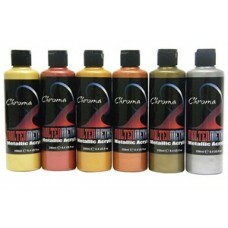 Chroma Molten Metals Metallic Acrylic comes in 6 luminous colors and is available in 250ml bottles and sets. This product does not contain egg, dairy, wheat, gluten, soy or peanut products, by-products or derivatives. This product does not contain latex materials or animal derived ingredients.